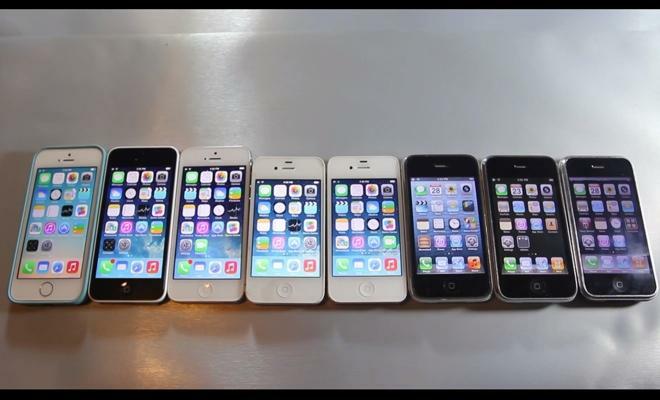 The evolution of Apple's iPhone  from the original model through the new 5s and 5c  was shown off recently in a new video that pits all eight released versions of the bestselling handset against each other in a test of speed. YouTube poster EverythingApplePro has posted a video recently showing every iPhone Apple has released  the original 2G iPhone, the 3G, 3GS, 4, 4S, 5, 5c, and 5c  simultaneously undergoing a speed test of sorts. The video poster  along with a number of helping hands  unlocks, shuts down, and starts up each device before conducting a web speed test on each. Notably, the results don't go exactly as one might expect. In the shutdown test, the earlier generations of iPhone  2G, 3G, and 3GS, all running iOS 6  all powered off before the newer models. The iPhone 4 had a comparable time to the older models, and the 4S, 5, 5c, and 5s all shut down at the same time. For the startup test, Apple's newest high-end device, the iPhone 5s, unsurprisingly beat its predecessors, besting the iPhone 5c by two or three seconds. The iPhone 5c showed the lockscreen just before the iPhone 5 did, though this could be an artifact of the imperfect testing method. The original iPhone actually took fifth place, coming after the iPhone 4S but before the 4, 3GS, and 3G. The videographer attributes this to the fact that the iPhone 4  even though it is years old by now  runs iOS 7, which likely means there is a different boot sequence that its older hardware takes longer to process. The original iPhone has not been updated since iOS 3.1.3. The web tests sent the devices to both Reddit and Apple's own home page, and the different generations of iPhone performed as expected. The 5s, with its significantly greater processing power, finishes well ahead of the previous generations. The videographer, though, notes that the difference in performance becomes more subtle as one moves up the generations toward the 5s, with Apple's newest model finishing well ahead of the 4S and older, but only slightly ahead of the 5 and 5c.